Skip the cheap stuff. You're being judged. 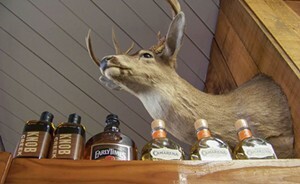 So many bottles of booze — single-malt scotches, tequilas, vodkas, Humboldt-made spirits and more — you walk out choice-drunk (but with sober plans to slowly sip your exclusive, single-barrel bourbon tasted, picked and bottled by owner John Baddeley). So many cigars, glowing in their leaf skins inside the walk-in humidor, you suddenly become a smoker. Or maybe you've quit that stuff, and rattle instead the doors of the glass case holding "Juicy e-liquid" vials bottled to look (disturbingly) like melted candy mixed with party bubbles. Getting married? The John's crew will set you up; if the tasting bar in the back of the store is open, you can enjoy a preview. Plus beer! Chocolates! Ice cream! Just be good: The ungulates on the walls (and the little fox) are watching.